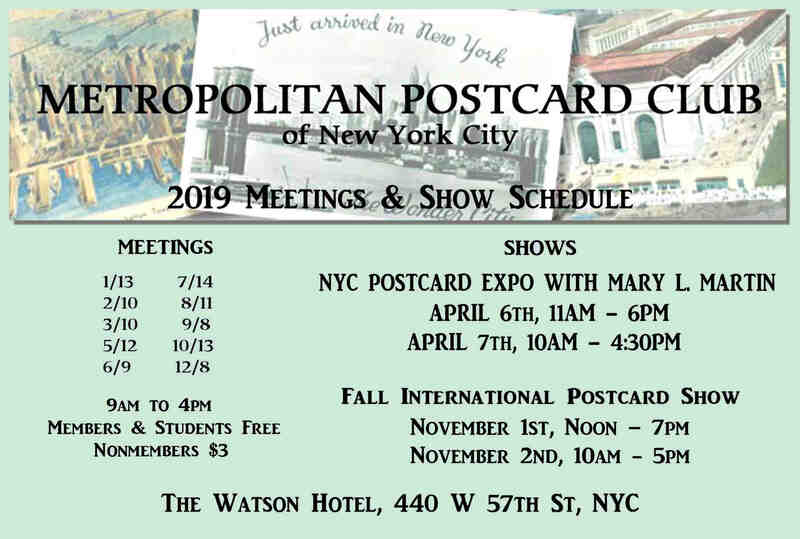 THE METROPOLITAN POSTCARD CLUB OF NEW YORK CITY, formerly called the Metropolitan Post Card Collectors Club, is the oldest continuously run postcard club in the United States. Membership is made up of both collectors and dealers of postcards from coast-to-coast and many from foreign countries as well. Not only has the Club been facilitating the exchange of postcards since its founding in 1946, it is dedicated to furthering the understanding and practice of Deltiology -- the collection and study of picture postcards. 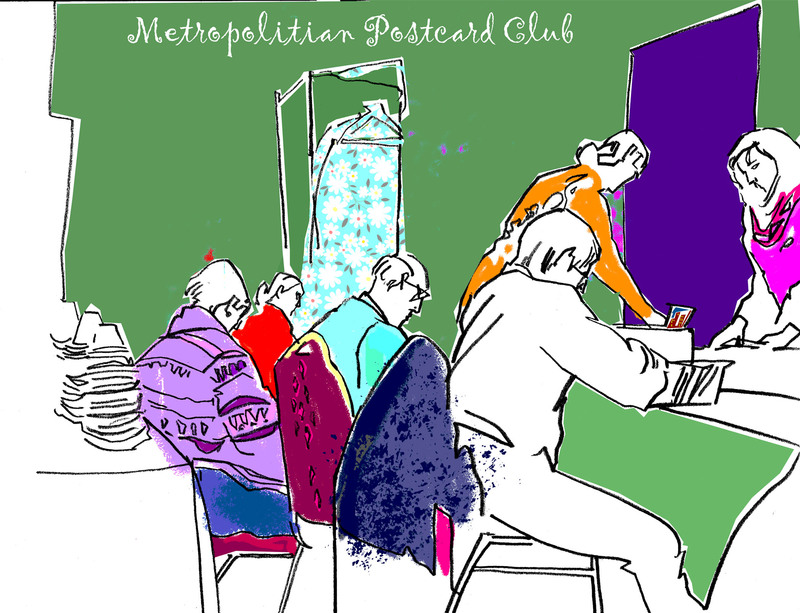 Club Meetings - Usually on the second Sunday of every month, with the exception of the Spring and Autumn show dates, the Metropolitan Postcard Club holds meetings. These are not formal meetings as only a brief amount of business is discussed. They are more in the line of friendly get-togethers where collectors and dealers of any experience can meet to buy and sell postcards. Members of the Club pay no fees to attend, with only a small table fee charged for dealers. Our meetings are also open to the general public for an admission fee of $3.00. At certain times of year the Club hosts special events such as fund raising sales, album competitions, and holiday parties. If you are a novice or are just thinking of becoming a collector, there will be plenty of expert advice for the taking. Please feel free to come and join us. 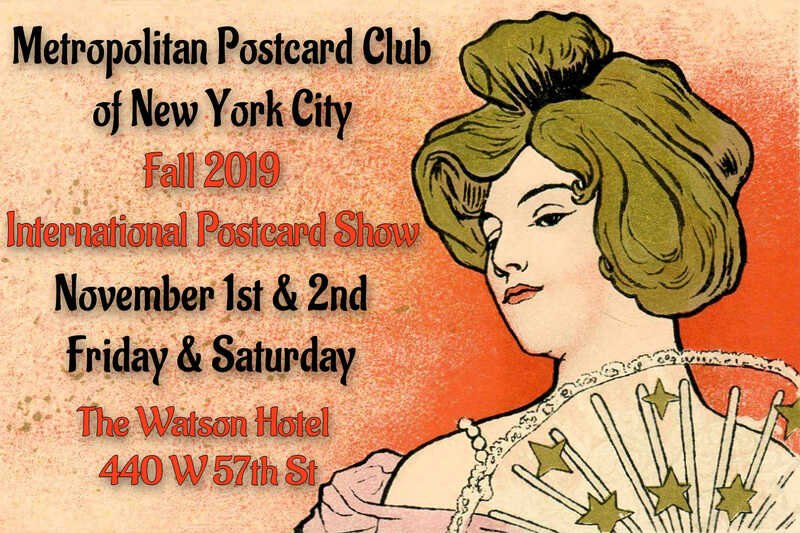 Postcard Shows - The Metropolitan Postcard Club sponsors a special two day show every November where approximately thirty-five to forty postcard dealers from around the nation and the world attend to introduce their cards to you. The postcards offered range from discount boxes to artist-signed cards and highly-valued rarities. We also co-sponsor a two day show in May with Mary Martin Ltd. Both shows are a great way to find cards. Shopping on the internet is in no way comparable to holding a card in your hand and seeing it with your own eyes. Just by browsing you will gain more familiarity with postcards and become a more knowledgeable collector. And of course, only at shows can you engage in interesting conversation about postcards and collecting. If you've never been to one of our postcard shows or meetings, please plan to attend! You will be pleasantly amazed, and certain to go home with a few treasures. Free access to all meetings. Discount rate to club-sponsored shows. Free entry into postcard album competitions, with prizes. Opportunities to set up and sell postcards at meetings. Free subscription to our beautiful printed bimonthly bulletin Metro News. Dues are $30 per person for one year: Good for 12 meetings or shows, and six bulletins. Only one bulletin will be sent out per household. Membership card will be mailed with your first newsletter. You may become a member at any club meetings or show, affective immediately upon payment of dues. You may also download an application from the link below and mail it in with your check or money order payable to the Metropolitan Postcard Club. See and LIKE us at Facebook> Metropolitan Postcard Club of New York City. Share our entertaining, informative, holiday & other timely posts with friends & fellow collectors. Help keep postcards alive.